Tekken 7 player Bronson Tran lived up to his nickname “the mouth of NorCal” this past Wednesday night when he received and rejected the MVP prize at E3’s Twitch Esports Arena invitational. Fans nominated the MVP via Twitter hashtag, and the winner was supposed to get a T-Mobile phone. Except, as Bronson explained while standing on T-Mobile’s stage, he uses AT&T and he’d rather not switch his data plan. Instead, Bronson plans to give his prize to a randomly selected Twitter fan. Bronson did not win the actual tournament, nor did he expect to win. In his player interview he joked about how T-Mobile should offer “participation trophies” for losers, as he expected to be one. Then, he ended up receiving the next best thing: the MVP award, which was more of a popularity contest. He kept the MVP trophy. The phone is still up for grabs. 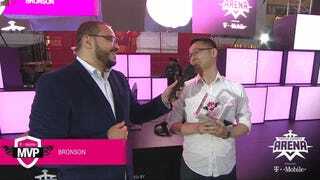 For all four of T-Mobile’s tournaments at E3 this week—Street Fighter V on Tuesday, Tekken 7 on Wednesday, then Injustice 2 and Overwatch on Thursday—viewers have been encouraged to vote for an “MVP” on Twitter. Each MVP has gotten the same prize, but Bronson is the only player who turned down the offer. The decision to turn down the phone plays into Bronson’s well-established persona as a sarcastic trash-talking jokester, but it also plays into the hesitation many fighting game players feel about the idea of “selling out.” Bronson can afford to reject the phone, because—as he joked during the event—he has a day job, unlike some of the other “pro” fighting game players participating in the invitational.